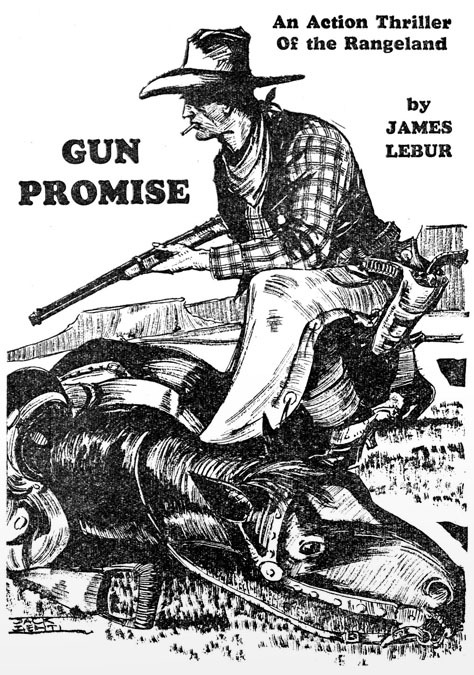 John Armas "Jack" Lehti was born July 29, 1912 in Brooklyn, New York City. His father, also named John Armas Lehti, was born 1884 in Finland. His mother, Christine W. Clayton, was born 1888 in NYC. They lived in the home of his maternal grandparents, William and Henrietta Clayton, at 453 81st Street in Brooklyn. His Uncle William R. Clayton Jr. (born in 1892) also lived with them, as well as his Aunt Bessie (born in 1885) and her daughter Etta (born in 1911). His father worked at an employment agency. In 1914 his father died at the age of thirty. After this tragic death "Jack" Lehti was raised by his mother's family. While she worked as a bank clerk to support the home, he was watched by his grandparents and his widowed aunt, along with his cousin Etta, who was only one year younger. He attended public schools in Brooklyn. In February of 1932 he graduated from Brooklyn's Manual Training High School, where he was listed as the yearbook as the "class artist." In 1931 he began to study at the Art Student's League on 215 West 57th Street in Manhattan, where he studied with Frank DuMond (1864-1938) and monitored a classroom seminar presented by Harvey Dunn. In 1935 John Lehti began to work as a commercial artist. In 1940 the U.S. Census listed him as twenty-eight and living at home with his fifty-year-old widowed mother and her widowed sister Bessie, as well as his eighty-year-old widowed grandmother Henrietta. "Jack" Lehti drew pen and ink interior story illustrations for pulp magazines. 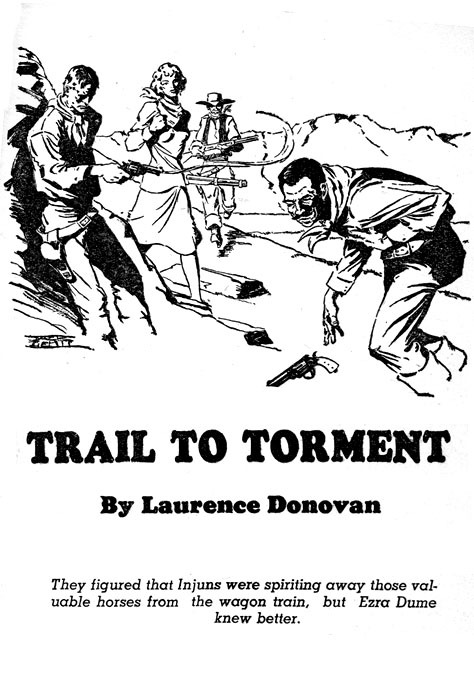 His work appeared in Real Western and Western Action. 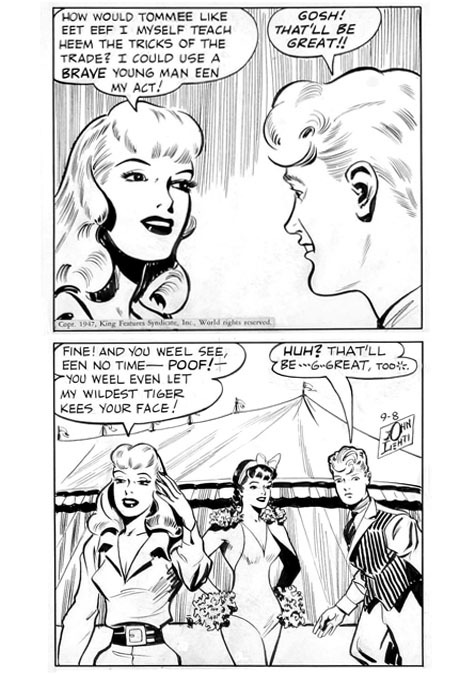 He also assisted on the syndicated newspaper comic strip "Secret Agent X-9." 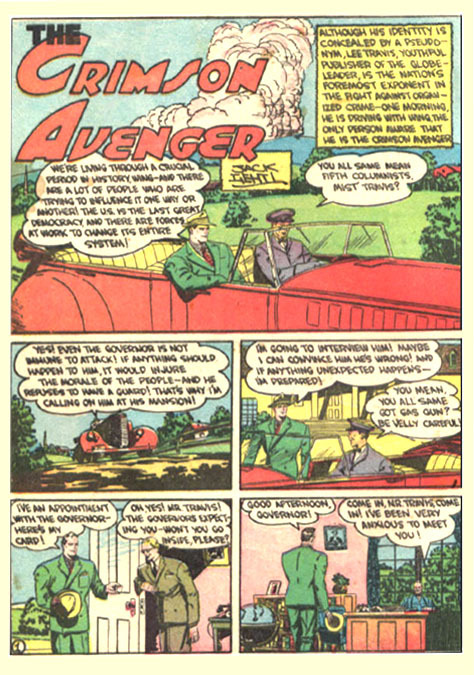 In 1940 he drew "The Crimson Avenger," "Sgt. O'Malley of the Red Coat Patrol," and "Cotton Carver" for DC Comics. On December 9, 1940 John Lehti married Paula Olsen. She was born in 1918 in New Jersey. She was an artist's model. Four months later, on April 7, 1941, John Lehti was drafted in the Army. In July of 1941 he suffered an attack of appendicitis and underwent emergency surgery. 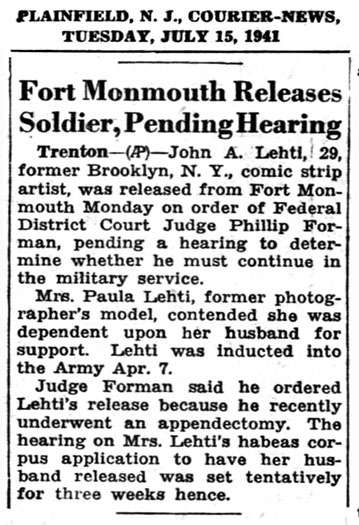 While recuperating in a NYC hospital his wife instituted a law suit to demand his deferment from military service in order to preserve her from destitution. The judge dismissed the case. On December 7, 1941, after the Japanese attacked Pearl Harbor, war was declared. John Lehti served with the 104th Infantry, and was honorably discharged at the rank of Sergeant with the Bronze Star, a Purple Heart, and four campaign ribbons. According to the artist, "When the war in Europe ended I was shaking hands with Russian soldiers seventy miles south-west of Berlin." He illustrated a published history of the WWII battle record of the 104th Infantry. After the war he returned to Brooklyn and lived with his wife at 183 Montague Street, and resumed his art career. He became art director of Picture News, an innovative hybrid publication that featured national news stories in a comic book format. On February 5, 1946 The Brooklyn Eagle newspaper published an article on John Lehti, entitled "Boro-Born Veteran Becomes Art Chief of New Magazine." 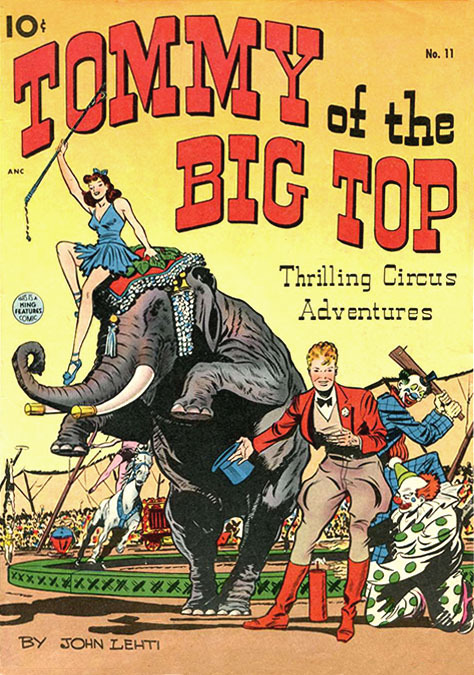 In 1947 he drew the newspaper comic strip "Tommy of the Big Top" for King Features. For ten weeks, from November 22, 1948 to February 5, 1949, John Lehti drew Tarzan for United Feature Syndicate, as an uncredited substitute for Dan Barry (1923-1997). 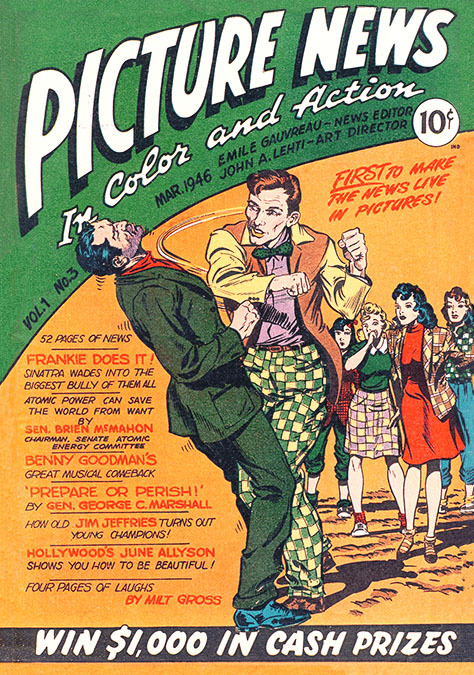 In 1950 he drew "Big Town" for DC Comics. 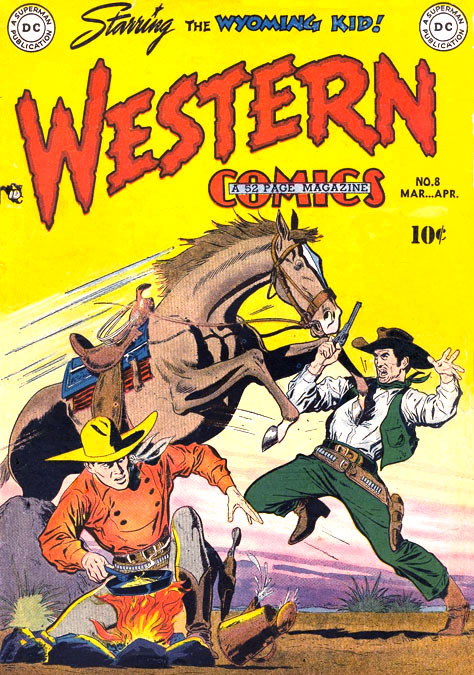 He also drew "Lassie," "Flash Gordon" and "Tom Corbet, Space Cadet" for Western Publishing. In 1954 John Lehti drew a syndicated newspaper comic strip entitled, "Tales From The Great Book." He approached the subject as a father speaking with a child about biblical events. 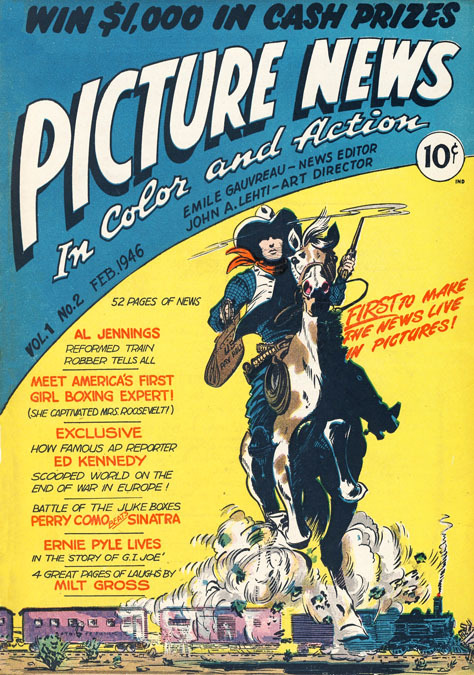 The popular comic strip ran for several decades and was even produced as an RCA Long Playing Recording that starred Ronald Reagan, Brian Aherne, and Joseph Cotten. 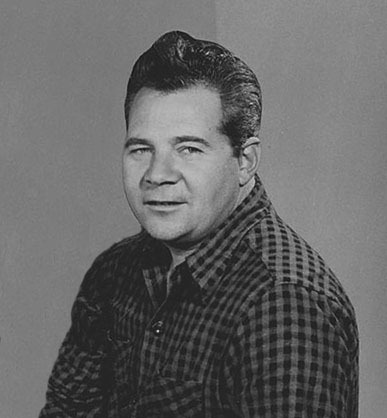 In 1958 John Lehti left Brooklyn and moved to Goshen, New York, which is fifteen miles west of Peekskill. 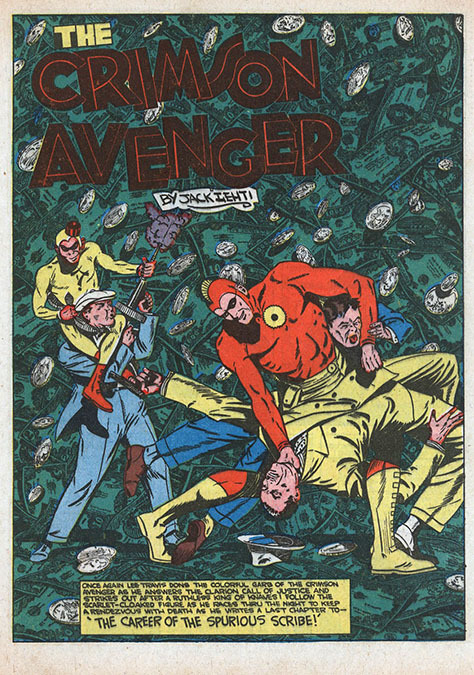 In 1972 he drew "The Losers" and "Sgt. Rock" for DC Comics. In 1978 he began to draw a nationally syndicated weekly newspaper feature entitled, "Facts About The Bible." 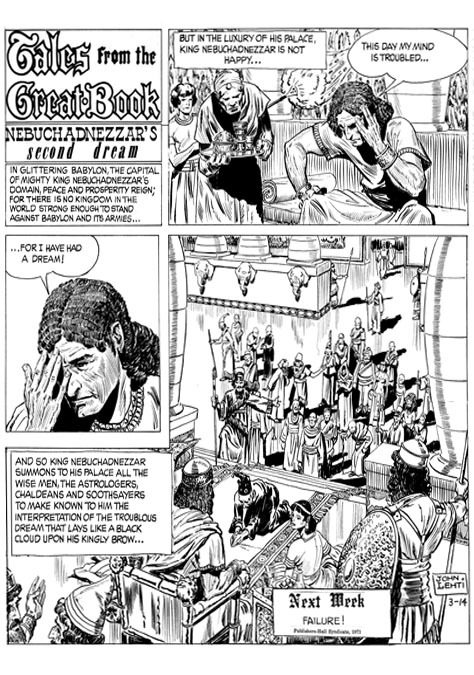 This series also illustrated biblical events. 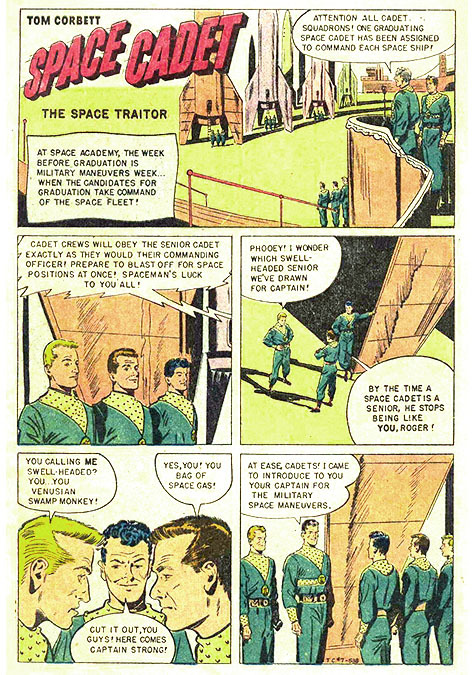 It had a unique format that included instructions for young readers to clip out the comic and "Save For Your Sunday School Scrapbook." John "Jack" Lehti died at the age of seventy-eight on January 5, 1991 in Goshen, NY. Posthumous reprints of his popular strip "Facts About The Bible" are still published every week in newspapers all across the nation.